Trump's trade guru has real talk for Germany. Trump’s Trade Guru Just Trashed Germany. He Actually Had a Point! The white-haired dude on the right is Trump’s trade adviser, Peter Navarro. Peter Navarro, Donald Trump’s White House trade guru, typically reserves his harshest rhetoric for China. But Tuesday, the economist managed to cause a bit of an international stir by laying into Germany, which he accused of exploiting the United States and its fellow European Union members with the help of a “grossly undervalued” currency. Navarro made his comments in an email interview with the Financial Times, which seemingly wanted to know his thought on the Transatlantic Trade and Investment Partnership, aka the big free-trade deal between the U.S. and the EU. Navarro was not encouraging about it. As a rule, the administration plans to pursue bilateral trade deals, not big multilateral trade agreements that rope in lots of different countries. 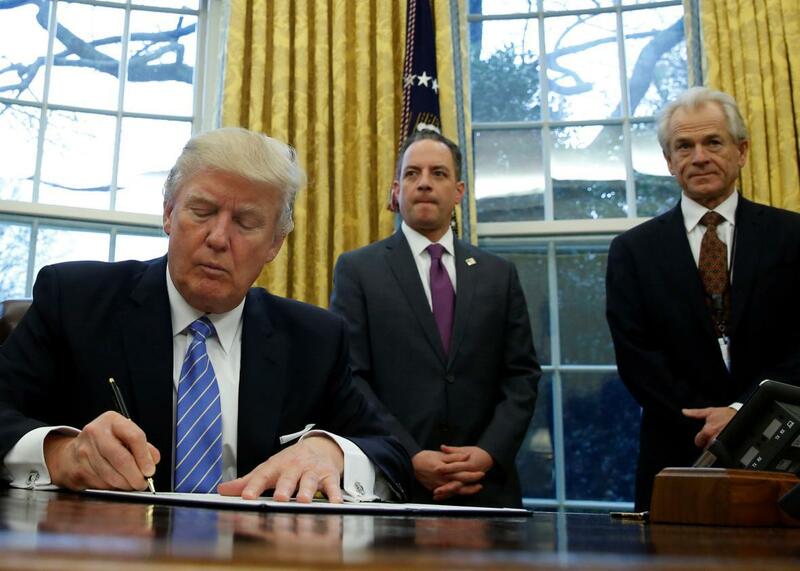 And even though the EU is a unified trade bloc, Navarro doesn’t feel like a pact with all of its members would pass the White House’s test. Why not? In part, Berlin. The global reaction was not exactly kind. The FT itself haughtily explained that “the view Berlin is intentionally advocating a weak euro to its own economic benefit is not widely shared.” Asked about the remarks, German Chancellor Angela Merkel essentially shrugged and suggested there wasn’t much her country could do to influence the euro’s exchange rate, because it didn’t control the EU’s monetary policy. “We won’t exercise any influence over the European Central Bank, so I can’t and I don’t want to change the situation as it is now,” Merkel said. Analysts were also dismissive of Navarro. “He hasn’t understood the euro or this is a serious conspiracy accusation,” Henrik Enderlein, director of the Jacques Delors Institut in Berlin, told the Telegraph. But all of this sort of missed the point. Based on his quote, Navarro wasn’t necessarily saying the euro was too cheap across the board. Instead, he was merely saying it was too cheap for Germany. This is something virtually everyone agrees on, except for maybe the Germans themselves. Were the deutsche mark still around, Germany’s massive trade surplus, which as a percentage of its economy is actually larger than China’s, would have forced up the value of its currency, leading it to import more and export less. Instead, Germany is locked into a trade and currency union with a group of economically weaker countries who keep the value of the euro down, which makes it easier for factories in Wolfsburg and Munich and Bremen to sell their wares both inside and outside Europe. There’s also plenty Germany could do to fix its trade imbalance, but isn’t. One reason it has such a large surplus from exports is that the country has an exceedingly high national savings rate—basically, Germans and their government don’t spend enough. As Bernanke suggested, Berlin could dabble more in budget deficits to rev up its economy, or take action to increase workers’ wages, both of which might lead to more imports. Alternatively, it could encourage more investment spending by corporations. The status quo, though, really isn’t healthy. Massive trade imbalances are not good for the global economy in the long term. Surplus countries find themselves with giant pools of savings they need to invest, which can create bubbles and financial crises. In Europe, it led cash-flush German bankscash to lend excessively to debtor nations like Greece that weren’t able to pay it back. The ensuing crises, of course, led Germany and its northern neighbors to enforce painful austerity programs that helped spread mass unemployment across the continent. No one wants a repeat of that. That isn’t to say Navarro’s concerns are entirely on point. The idea that Germany might be stealing a significant number of American jobs these days is a bit far-fetched. But refusing to sign a trade pact with Europe at large unless Germany becomes a more responsible actor isn’t really nuts. In fact, if the message were coming from any other administration, it might serve as a necessary wake-up call. When a Trumpkin is right, they’re right.